They watched. 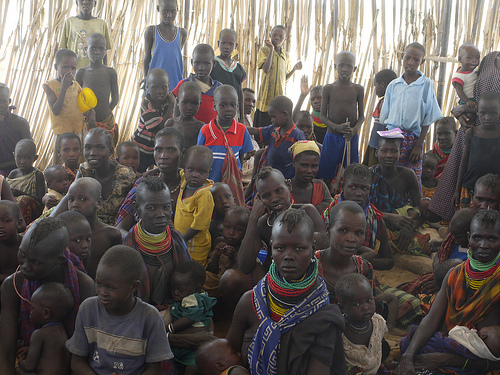 A hundred eyes were trained on me as I entered a room packed full of Turkana women, each cradling a child in their arms. They were adorned in huge colourful necklaces and wore trademark Mohican style haircuts. In their gaze I saw mixed impressions. Wariness, curiosity, hope. This was one of Merlin’s outreach projects, the medical aid charity I’m raising funds for, and these sentient eyes belonged to the mothers and children directly affected by their work. Two nurses were weighing, measuring and vaccinating the infants and they dished out nutritional supplements along the way. So far this morning five children had been deemed to be suffering from severe malnutrition, some of these may also be suffering from the affects of co-existing disease such as HIV or tuberculosis. They would be transferred by Merlin to the Stabilisation Unit in the nearest hospital at Lodwar. Everything about this remote Northwest province of Kenya appeared tough and unforgiving. Tough to live here, tough to survive here and tough to provide healthcare to the inhabitants, the bold and ambitious task taken on by Merlin amongst others. The region is roughly the size of Scotland, with a tenth of the population. The Turkana are nomadic pastoralists, put down a medical clinic and chances are they won’t be around for long to use it. Merlin understand that you usually have to go to them. The area is intensely hot and arid, no rain fell at all during the short wet season this year. The longer the current drought rages on, the further they travel in search of greener earth, sometimes crossing international boundaries. When water is available it goes to the goats first, without them there’s no milk and no food. The Turkana, like other tribes, often cut the necks of the goats, mix the blood with milk and drink it. Merlin work to strengthen the capacity of remote clinics in Turkana and on day two I was able to visit one and learn something of the success stories. The last epidemic of measles was in 2002, others may well have been prevented by Merlin’s attention to mass vaccination programmes. Medicines, staff, training and equipment are all essential and there seemed to be even more Merlin could do here with more funds and resources. On my third day I visited the local hospital in Lodwar and met children suffering diseases and conditions rarely encountered in the Western hospitals I trained in, tropical disease just another in the long list of burdens facing the population. I met a severely stunted five year old with visceral leishmaniasis, or Kala Azar, a parasitic infection I’d only ever read about in medical textbooks. Another had a snake bite, it was the forth bite from a carpet viper they had seen so far this year. Cases of polio do come in, but I was told that by the time patients present the disease is usually very advanced and sufferers often die or are left with permanent paralysis. One bay was devoted to the severely malnourished babies. They were oedematous, quiet and meek in their mother’s arms. Now I was looking right into the heart of this need, staring it down. 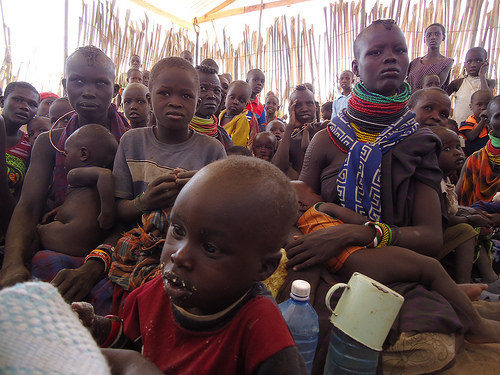 The Turkana are tough and resilient people coping with poverty, disease, drought, malnutrition, occasional conflict and an unforgiving environment and they are a group vulnerable for all those reasons. These are people living on the brink and if no rain falls in the wet season this year they will fall, Merlin will do their best to catch them. Having seen Merlin’s efforts firsthand I left Lodwar in no doubt that their work here is essential to the health and wellbeing of the Turkana and that the money raised through my journey was going right to where they said it would, to a community in great, great need. 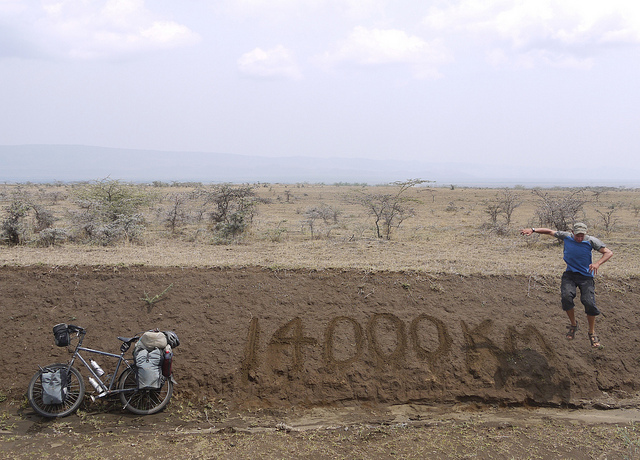 I left town and began my journey across the boundary between Turkana and Pukot territory. I wondered if I was also crossing another boundary, the hazy line that lies between the adventurous and the foolhardy. Then came warning number six, a truck stopped and the driver leaned out of the window, his face said what the hell do you think you’re doing? ‘You’ll be killed’ he said finally ‘bandits are everywhere’. I imagined people chatting at my funeral ‘I know, I know, it’s very sad. And to think, he wasn’t really cycling around the world at all’. I was dropped off at a campsite which smelt of mushrooms and which had a large group of endemic monkeys scampering around the tents. Every so often they would get into a loud and vicious fight. Back on my bike I started out riding through undulating hills, through tea planatations and in and out of luscious green valleys. When I arrived into one town a young Kenyan lad ran out in front of me and started cleaning my bike with an old rag. When he was done he yelled ‘Go go go!’ and patted me on the back. I cycled off feeling a little like a Formula One racing driver at a pit stop. I carry my life around on my bicycle and there’s little room for luxuries. I have begun to get attached to the few possessions I own. I recently christened one of my inner tubes ‘Old Patchy’ after the 25 odd repair jobs he’s been through. On my way to Nairobi came the sudden and unsettling realisation that I may have befriended an inner tube. For anyone worried about my mental state I must stress that I’ve never had a (full) conversation with Old Patchy and I didn’t shed a tear when he eventually headed for the dustbin. I continued south through the Kenyan countryside and picked up a curious smell. A nice smell. A great smell. Not just one, a host of different scents mixed together, but the combination familiar and now unmistakable. It was the smell of home. They say your sense of smell is the strongest link to your past, Kenya filled me with nostalgia and I realised suddenly that this was now the longest I have ever been away from home. The smell was from my childhood, of plants and flowers with names I’ve never known. Rain fell for almost the first time since I left Europe behind me six months ago and the countryside began to smell even more like the England I remember. It was still raining as I crossed the equator, a line I expect to ride through another five times before I get back to England. The rain was cool, refreshing, copious and welcome. You never miss the rain until it’s gone. There were numerous other small similarities to home, many probably relics of Kenya’s colonial past. Money is colloquially referred to as ‘bob’, people (are supposed to) drive on the left, electrical sockets have three pins, even the traffic police uniforms look strikingly similar to ours and tea always, always comes with milk. Judging by the boozy aroma emanating from virtually every Kenyan male that approached us, Kenya also has an alcohol problem to rival that of the UK. In Nairobi I was reunited with Nyomi after a month apart, a month during which she had hiked 5000 metres up Mount Kenya with her boyfriend, we swapped tales of our separate adventures. I looked at her bike and noticed that a catapult now sat tethered to the handlebars. I pointed at it and raised my palms skyward in question. ‘For the monkeys!’ she declared with bright eyes and a winsome grin. I won’t deny we needed the break from each other, but it felt good to be cycling together again. Earlier on in our African adventure Nyomi’s dreadlocks and the sign which sat on the front of her handlebar bag emblazoned with the words ‘I DON’T BRAKE FOR ANYONE’ had given her a bizarre and unique appearance. Her look often made me chuckle, I loved the sharp contrast between ‘friendly hippy’ and ‘violent sociopath’. When we met up again Nyomi had decided that enough was enough and those dreads had to go. 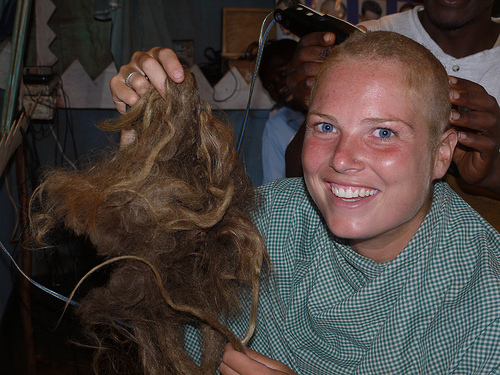 She shaved her head – grade 1 – raging sociopath. At least drivers will think twice about cutting us up in future. I’m trying hard to encourage her to invest in some fake gold teeth and a studded leather neck collar. 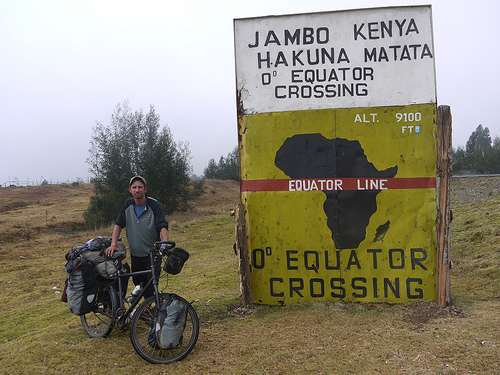 In Nairobi I visited the Merlin team based there and stayed with John, an expat and another seasoned cycle tourer. After the well needed break Nyomi and I set off, travelling west towards Uganda. My journal entry from Thursday Febuary 17th reads simply ‘washout’. Some days just are, nothing you can do, nothing you can prepare for and no level of positive thinking will change that. 6.15 am – Wake up in my tent. We had camped with the police in the outskirts of a small town. I tell Nyomi I’m excited about the day ahead, my first day riding through Masai country. I’m optimistic we’ll cover a good 140 km before sunset. 7 am – Tent down, bike packed, mango consumed, police thanked. 7.01 am – Attempt to pump up back tyre. Pump breaks and air escapes from tyre. 12.30 – We sit down for lunch. Ny sits on an ant’s nest, I sit on a thorn bush. 15.30 – Thunder, lightning and heavy downpour. We get a soaking. 16.00 – We agree to officially class the day as a washout and a right-off. We’ve covered 26 km all day. 16.30 – We find a cheap hostel and decide to focus on tomorrow. As I lift up my bicycle to get it over the step the back wheel falls off. I’d forgotten to tighten it back on again after I fixed my last puncture. Crowd of onlookers laugh. So do I. In the tropics when the rain settles and the sun shines once more, the land becomes caked in a damp, glistening, refulgent glow. There’s the foliant blaze of wet vegetation, the splendent gold of the yellow fever trees and the tiny brilliant scarlet dots of Masai people working in the fields. We pushed west with the infamous Masai Mara game reserve lying to our left and stretching out to the horizon and together we sang. It was two days out from Nairobi when I noticed a portentous concrescence of dark grey clouds, almost black, overhead. There was a sudden disquieting groan, as if the sky above were being tortured. Each clap of thunder soon became indistinguishable from the last, a constant rumble echoed through the dimming light and quickening breeze. Within seconds the sky opened its dark underbelly and hail fired down upon us. We scrambled for raincoats and with no shelter nearby we hunched double over our bikes and covered our ears as the large hailstones smashed into our heads and backs, stinging as they made impact. After ten minutes the hail had turned to rain and we began to pedal onwards. It rained for the last days we spent in Nairobi and for almost every day since. Not the steady drizzle of Blighty but tropical rain, rain preceded by warm sunshine and then abrupt and torrential. It usually persists until sunset which is a sudden eclipse unlike the sunset of northern latitudes. I know the familiar pattern will only get more familiar, this is just the start of the big wet season which reaches its peak for us in April when we ride through Rwandan rainforest and then Tanzanian savannah. After three days on the road (discounting the ‘washout’) we reached Kisii and met up with Merlin once again with a plan to visit projects in the area. Kisii was the polar opposite of Turkana – densely populated, wet and green with abundant food and water. The main problems being tackled here were HIV, tuberculosis and malaria. We visited a HIV clinic, the pure numbers involved incomprehensible. The hospital was heaving and it was easy to see how and why HIV infection in Africa is so often referred to as an epidemic. 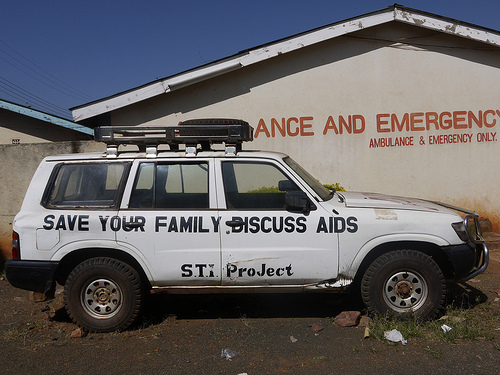 This one centre had an HIV positive population of 10,000 under it’s care. Some experiences with patients as a health care worker will always stay with you, indelible recollections of the good and the bad. For me the first and only time I have had to give a patient a positive diagnosis of HIV infection is one. In an instant I gained insight into the deep psychosocial trauma of HIV. Here in Kenya nurses counselled small groups of patients about to start on treatment and I didn’t envy their task but I could see how vital education, advice and support would be, and the groups also functioned to show people that they weren’t alone, that other people were suffering too, or in Kenya’s case, lots and lots of other people. On the road west we passed villages just five or ten kilometres from the place of Barrick Obama’s grandmother’s home. The young men here described Obama as ‘our brother’, the pride was palpable. For a small fee you could visit Obama’s grandmother, she is now a popular tourist attraction. I waved goodbye to the last of the smiling Kenyans and crossed the border into Uganda. 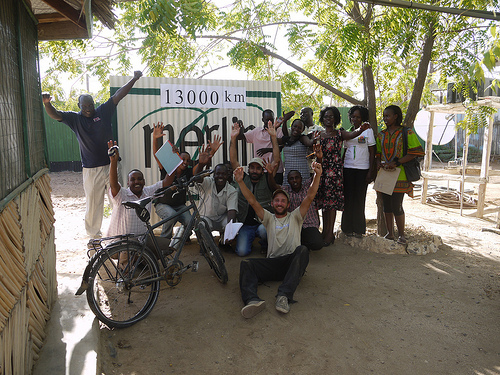 Me and the Merlin team celebrating my 13,000 km milestone in Lodwar, Turkana. In Nairobi I also found the time to add tags to all my images on Flickr, an online photo sharing service. To see a list of my tags click here, to see photos arranged in sets by country click here and to see a chronological slideshow of some of the best images from my ride so far click here. "…portentous concrescence…" love it, love it, love it. Keep up the touring and great writing. It is certainly not absurd to me. Wish I could do something similar (confined to shorter trips due to work and family commitments). P.S. Hope you got a new pump and tubes. Also, have you thought about different tyres? Have no words… simply… beautiful! it gives me a whole vocabulary of feelings. I envy you…even if I know it is not always that self clear and not that amazing either. Thanks for sharing. Say hello to Belinda. wonder where you are right now…Lena from Finland…we met at the upper hill campsite in Nairobi. The two crazy ones with project in Mwanza, Tanzania. Keep it up sir! I am so very impressed by your determination and wonderful optimism! I see that you have an ipod on your travels, so I will attempt to send you a couple of mixtapes.